Zuidervaart claims that classic reformational thinkers, by being overly preoccupied with identifying and shoring up the “sphere sovereignty” of individual (types of) differentiated societal structures, “do not ask whether distinct social institutions, for example in the areas of art, education, economy, polity, kinship, and faith life might themselves belong to larger patterns of social organization.” They thereby fail to confront the depths of contemporary societal distortions, or to permit a sufficient engagement with contemporary social theory. “For claims about societal differentiation and advocacy of structural pluralism will come to little if in fact contemporary society…does not fit the projected pattern of multiple differentiated spheres” (258). I take this to mean that if an inherited social theory can’t shed adequate light on the most palpable structural dynamics and distortions of contemporary society, then it must be significantly revamped. Zuidervaart’s revamping proposes that these features need to be explained in terms of three dominant “macrostructures” – “large-scale structurations of contemporary social life” (259): the “proprietary economy;” the “administrative state;” and “civil society” – resulting in a “triaxial model” (257ff.). The arrival of these distinct macrostructures in modernity is in itself a significant achievement (267), but the contemporary operations of, and interactions between, them disclose deep distortions. The first two macrostructures are “formal” while the third is “informal.” “Formal” means “systemic,” in the sense of being “operationally self-contained,” i.e., following their own “logics” and having their own “steering media” (money for the proprietary economy, power for the administrative state) (258-9). Such a “systemic mode of organization” has the advantage that these two macrostructures “can proceed without continual communicative interaction by human agents” while its disadvantage is that they are prone to crisis tendencies and “resistant to normatively motivated critique and resistance” (259). By contrast, civil society is “informal,” consisting of a “diffuse array of organizations, institutions and social movements” lacking those systemic properties. This informality allows for communicative interaction among participants but leaves civil society vulnerable to “systemic pressures” from the other two macrostructures (259). His account of the economic dimension of civil society is the part of the chapter I found most illuminating and persuasive (so I won’t say much more about it). Let me simply pose one question intended to invite further clarification. I wonder what concept of “societal system” underlies the idea of a formal macrostructure. How does it actually serve to explain the highly complex and diverse societal phenomena under scrutiny? Systems theory is, of course, widely employed in contemporary social theory. It was developed in sociology extensively in the work of, e.g., Talcott Parsons (on whom, I recall, Habermas depends). It has yielded highly suggestive results and today is operating at a high peak of sophistication in areas such as complexity theory and risk analysis. But as I understand it, it first emerged out of the discipline of cybernetics (a branch of engineering) and, notwithstanding its huge theoretical advances since then, I wonder whether it has entirely shed its original mechanistic and deterministic traits. If so, is it possible that such traits might have adversely affected Habermasian notions such as “operational self-containment” or “steering media” on which Zuidervaart draws? Do these concepts lead to an understanding of the state and the economy as excessively constrained by structural pressures over which institutional and individual actors in these macrostructures are thought to have little control? Zuidervaart recognises that some degree of structural change to these systems is indeed possible via concerted political action, notwithstanding their “resistance to normatively motivated critique”; he is no pessimist on that score (and nor is Habermas). But I wonder whether his theoretical accounts of proprietary economy and administrative state suggest that we are more tightly bound in what Weber called an “iron cage” than is really the case? Do these concepts lead to an understanding of the state and the economy as excessively constrained by structural pressures over which institutional and individual actors in these macrostructures are thought to have little control? The idea of system as Zuidervaart employs it seems most compelling when applied to the commanding heights of the contemporary capitalist economy, which increasingly displays the properties of a closely integrated global “system” driven by the “logic” of profit-maximization and by its “inexorably expansive character” (264). I’m inclined to think it’s less compelling when applied to the state. I agree that the modern state often prioritizes bureaucratic concerns over justice, resourcefulness and solidarity (265), and displays its own “logic” which imposes uniformity and conformity often at the expense of particular cases. But does this make the modern state a formal “system” in his sense? Democratic states seem to me not to be quite so “operationally self-contained” as this notion implies. Democratic mobilizations can indeed effect significant structural changes. In spite of its significant limitations, the Paris Climate Summit of December 2015 demonstrated that concerted action on the part of social movements and political campaigns can, given conducive conditions, challenge the “logics” of even global institutions. One might express this worry about “flattening” (applying it now both to state and economy) as the concern that, in an exemplary desire to identity the “large-scale structurations of contemporary social life” that have been neglected in reformational social thought, Zuidervaart might have unduly played down the continuing illumination that can be derived from a precise identification of the highly variable “differentiated spheres” that, however embattled, still animate contemporary society. Zuidervaart rightly insists on recognizing the “integrity of distinct macrostructures” since each makes a uniquely important contribution to the flourishing of human society. But presumably that is not incompatible with an equally sharp recognition of the finely-grained diversity and structurally specific integrity of many differentiated societal spheres. Most reformational social and political thinkers and activists have gravitated towards a model of gradualist political reform, preferring the achievement of incremental change over the pursuit of far-reaching society-wide transformations. Zuidervaart is evidently supportive of incremental change but he wants to frame it in terms of the much more ambitious project of the “differential transformation” of the whole of society (266ff.). Looking to the future we can envision possibilities for structural transformation and normative redirection that build on the historical achievements and repair or remove the historical failures. In the midst of such historical orientation and reorientation, people can hear a call to life-giving disclosure that resonates in historically embedded societal principles and in our attempts to be faithful to them. In other words, within our organizations, institutions, and interpersonal relations, we can undertake faithful disclosure (274). Envisioning our human efforts at society-wide transformation in terms of “faithful disclosure” is a helpful, and hopeful, way to construe a wide range of initiatives towards a better realization of societal flourishing. It is an attractive vision, but I wonder whether it might be enhanced by linking it more explicitly to his passing discussion, at the start of the chapter, of the eschatological horizon. Reformational social thought, he rightly charges, has been “eschatologically thin” (255), insufficiently attentive to “the promissory character of God’s will in relation to Gods own future,” and overlooking “what God promises as the fulfilment of creation-wide and historically developed potentials” (256). What “we envision,” then, can be informed, energized (while no doubt also at times corrected or even overturned) by those revealed promises that truly come from beyond our own imagining or capacities. Could we put the point this way? The “call to life-giving disclosure” comes from a God whose “mighty acts” in history were regularly celebrated by the people of Israel, reviving their hope that what God promised for the future would really occur – in history, albeit well beyond a temporal horizon they themselves could precisely anticipate. Zuidervaart’s third strategic move is from “creation ordinances” to “historical societal principles.” By deferring a treatment of this question until now, I wanted to let it become clear that the substance of his constructive theoretical framework already carries considerable appeal and force, quite apart from its relation to the quite distinctive reformational idea of “creation ordinances.” But since he puts the issue on the table, we’re invited to probe his discussion. Zuidervaart finds fault with the language of “creation ordinances” on three counts: ontologically, it depends on an unhistorical notion of “givenness;” epistemologically, it depends on a naïve assumption of knowability; theologically, it prioritizes creation at the expense of suffering, redemption and hope (I’ll say no more about the third here). I’ll explore this critique only in relation to Dooyeweerd. The first charge seems the most crucial but first a word about the second. Zuidervaart rightly observes that “doubts have arisen about our ability to discern what the relevant creational ordinances are and what they mean” (254). Given serious past misconstruals of putative creational structures (such as patriarchal construals of marriage, proprietarian construals of government, ethnic construals of nationhood), an initial posture of scepticism towards any particular construal is not only fully understandable but absolutely necessary (cf. 11-12). Zuidervaart is correct to observe that “when one turns to creation for insight into what God wills for human life, one inevitably turns to intrinsically hermeneutical matters – to cultural practices, social institutions, and human relationships that embody interpretations of who we are, what we need, and what our lives mean”; and to insist that, “[confidence] that, all things considered, a specific decision or action or mode of organization is in line with God’s will…must be won rather than assumed” (255). He goes on, however, to say that “it is a fundamental mistake to treat [creational ordinances] as epistemological ‘givens’” (255). That’s true. But while such a criticism might be justly directed at Kuyper, it does not apply to Dooyeweerd, who certainly worked hard to “win” such confidence through meticulous (if at times laborious) argumentation. His construals of creational structures were indeed “arrived at through nuanced interpretations rather than postulated as the starting point for deliberation” (255) – however flawed we may conclude they were in particular cases. [Dooyeweerd's] construals of creational structures were indeed “arrived at through nuanced interpretations rather than postulated as the starting point for deliberation” – however flawed we may conclude they were in particular cases. On the ontological charge, Zuidervaart holds that “when it comes to social order, it is problematic to regard so-called creational ordinances as straightforwardly ‘given’ in an ontological sense.” If human existence is the outcome of an “evolutionary process of hominization,” then we need an “evolutionary and historical conception of how God’s will for human life emerges over time and within the changing fabric of social existence” (254). Let me make two points in response. First, Dooyeweerd himself does not claim that such ordinances are “straightforwardly given,” but is highly attentive to the fact that what he calls societal “structural principles” do indeed “emerge over time…within the changing fabric of social existence” (where, for him, “emerge” means “come to concrete expression”). For him there is no conflict between an affirmation of ontological givenness and a thorough acknowledgment of the historicity of the processes by which such givenness gets unfolded historically; indeed there is an ontological structure making historicity itself possible (the highly complex “process of disclosure”). While we may well find fault with his detailed accounts of these two poles and how they are supposed to relate (as many have and as I also do), it’s important to get his own intentions right. Second, Zuidervaart holds that my own attempt at a “critical retrieval” of the impugned notion of creation ordinances does not go far enough (254). He’s right about that. But I’m still not quite persuaded of his key reason why. My proposal is to ground the normative design of social structures not in Dooyeweerd’s “invariant structural principles” but rather in a “given, stable, but dynamically unfolding, created structure of the human person” (255). Zuidervaart counters that human personhood is “not so much a ‘created structure’ as it is a historical achievement: hominids have become human over a long process in which they themselves have taken an active and creative role” (255). I confess I do not yet see why it must be one or the other. Can we not construe the created structure of human personhood as itself necessarily involving the capacity to exercise formative human agency and thus as indeed properly developing over time (albeit within certain constraints)? It seems unlikely that Zuidervaart is implying that there is no stability at all to “human personhood” – that it could in principle undergo comprehensive redefinition? That might harbour consequences he himself might find troubling. If, as he suggests, personhood “is inextricably tied to the gradual emergence of certain social structures, minimally of a legal and ethical sort” (255), did human beings prior to the emergence of such structures (he doesn’t specify when) lack “personhood”? And is the evolutionary process of human emergence (hominization) now complete, or might the meaning of humanness evolve into radically new forms in ages to come? If so – to put the point provocatively – might that line of thought unintentionally open up the prospect that, if we humans have significantly shaped what it is to be human in the past, we might legitimately seize the evolutionary reins in our own time and, utilizing our advanced knowledge, take up the project of “human enhancement” (as “post-humanists” propose)? Would such a project run up against any “given” ontological limits – such as the distinctions between humans and animals (on which see Peter Lok’s excellent post) or humans and robots? A similar sort of question can be posed in relation to Zuidervaart’s central notion of “historical societal principles.” I find his account of the content of these essentially congenial, and his deployment of them in his larger account of societal transformation highly instructive (261). The observation that societal principles are “historically emergent” and not “simply what the Creator has mandated from the very beginning” is an important one. The suggestion that “they have taken shape and gone into effect as human beings have responded to God’s gift and call… [to love]” also seems congenial. And the recognition that they are, and must be, continually contested as humans engage in historical struggles for justice (etc.) is undeniable. Zuidervaart proposes that societal principles be understood as “modal principles” rather than “structural principles” (262), the latter being construed by Dooyeweerd, problematically, as “invariant.” Yet, unlike Dooyeweerd’s modal principles, he also regards them as not given originally in creation but as “historical horizons,” “future-oriented callings in which the voice of God can be heard and traces of a new Earth can appear” (283). Thus not only are societal principles not “invariant,” but they may undergo radical shifts in content: “What solidarity means and requires today…would have been unavailable and incomprehensible in a premodern world….” (261). I’d accept that the particular meanings and manifestations of solidarity change substantially over time (compare guild solidarity with that evident in a modern trade union). But would we really want to say that premodern people could make no sense of the idea that (as Zuidervaart defines solidarity), “no individual, group, or community should be excluded from the recognition we owe to each other as fellow human beings”? Equally, it seems problematic to claim that “we do not know now what solidarity, resourcefulness, and justice will mean and require in a hundred years” (262-3). Really? We presumably know that solidarity, for example, will continue to mean “non-exclusive recognition.” Don’t we also know that this will require, for example, that no human being be subjected to arbitrary violence or abuse, that all are entitled to have their basic needs for food, shelter, etc., satisfied, that societies governed by the rule of law are better at securing public justice than others; and so forth? Looking back a century, did those alive then have no idea what such societal principles would mean or require today? If so, how could they have reliably directed their actions towards what they took to be an effective long-term project of “societal transformation”? I am unclear, then, how Zuidervaart can entirely resist the charge that his account of societal principles allows an element of “arbitrariness” to creep in. He denies that charge (284) but has, to me, not yet sufficiently rebutted it. justice is not a divinely given principle that must then be “positivized” [implemented] by human effort. Rather, God comes to call us to justice and to gift us with justice as, within historically emergent practices and institutions, human beings work out the flourishing to which they are invited. Human responses to God’s gift and call become constitutive of what justice means and what it requires. This elliptical formulation also invites clarification. If it means that the human response to God’s call to justice constitutes the content of justice, then that risks rendering the very concept of “response” incoherent. Response to what? What is the actual substance of that divine call? Elsewhere he asserts that “societal principles are [not] in effect prior to their [human] formulation” (324; cf. 283). He reminds us that for Dooyeweerd, such an account would evoke the “spectre of historicism” (283). It’s true that Dooyeweerd sometimes lobs that charge around somewhat ham-fistedly. His reply is: “if one locates creational ordinances outside human history, then one needs to explain how they become effective within human history, raising the threat of an infinite regress” (284). ... what precisely is it to which humans beings “respond” when they formulate societal principles, if there is nothing yet “in effect”? That point taken, however, what precisely is it to which humans beings “respond” when they formulate societal principles, if there is nothing yet “in effect”? On its face this seems to stand in tension with the way the Hebrew scriptures speak about divine and human justice. It’s indeed true that this Hebraic account does not operate with a simple binary contrast between divine command and human obedience. Rather it includes the thought that God not only dispenses justice from the heavens but also “gives justice” to his people as they work out the meaning of torah in concrete circumstances, a point often overlooked in traditional theological ethics which read torah as a mere law-code. But that is not at the expense of the idea that the content of torah originates with, discloses the creative and covenantal ordering wisdom of, and bears the authoritative command of, God – in the face of which humans are always first of all in the posture of respondents. Notwithstanding these critical questions, Lambert Zuidervaart’s book is a wonderful gift to the community of Christian scholars. They are now invited to receive it in the same spirit of “critical retrieval” that informs his own work. In the Epilogue, “Earth’s Lament,” he claims, plausibly, that classical thinkers do not adequately take the measure of “societal evil” (320). Bob Goudzwaard’s important work in the 1970s attempted to revamp it at the level of the economy (Capitalism and Progress: A Diagnosis of Western Society [Grand Rapids: Eerdmans/Toronto: Wedge, 1979]). Zuidervaart acknowledges his debt to that work, albeit more for what it reveals about the “spiritual underpinnings” of macrostructures and their “normative distortions” than for an account of the macrostructures themselves [377 n14]). Zuidervaart might perhaps agree that there is more in Goudzwaard’s account of the co-dependency relationship between state and capitalist economy than he here makes use of. Sander Griffioen’s social philosophy could also enrich an account of macrostructures by disclosing the extent to which “culture” profoundly shapes them (see, e.g. Moed voor cultuur. Een actuale filosofie [Amsterdam: Buijten & Schipperheijn, 2003]). He rightly adds that this is not only a descriptive or explanatory model but inescapably also a normative one (257). He rejects Habermas’s view that such systems are instances of “norm-free sociality” accessible only via “the objectivating attitude of the social sciences” (377 n5). See his Art in Public: Politics, Economics, and a Democratic Culture (Cambridge: Cambridge University Press, 2011), ch. 5. In (American) political science, it was introduced in the 1960s by thinkers such as David Easton to bring theoretical coherence to the emerging mass of under-interpreted empirical data generated by what was then termed “behavioralism,” a version of positivism. Dooyeweerd’s tentative steps in this direction utilize his notions of inter-institutional interlinkage and “enkaptic interlacement.” I try to push them further in Jonathan Chaplin, Herman Dooyeweerd: Christian Philosopher of State and Civil Society (Notre Dame, IN: University of Notre Dame Press, 2011), 130-138 and ch. 11. As Zuidervaart rightly puts it in Social Philosophy After Adorno (Cambridge: Cambridge University Press, 2007): “many potential sources of change call for sufficiently comprehensive articulation” (p165). Or, as Zuidervaart himself describes it in the Epilogue, a horizon in which God “ushers in a ‘new Earth’ where God will live with human beings and ‘will wipe every tear from their eyes’” (318). 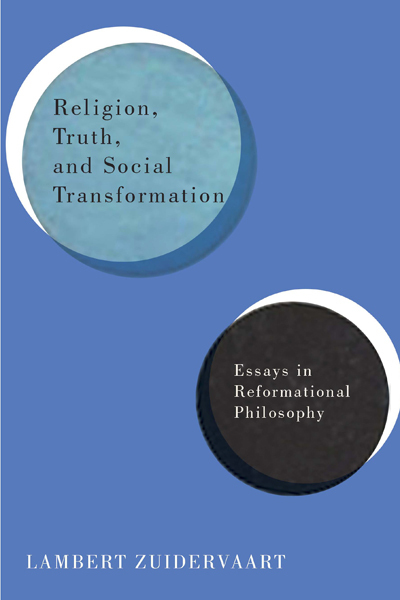 Indeed, as he puts it: “The struggle over how to conceptualize divine law characterizes much of reformational philosophy in the next generation [after Dooyeweerd and Vollenhoven], including my own work” (8). Attempts by neo-Lutheran theologians in interwar Germany to legitimate a narrowly ethnic notion of the “volk” as an “order of creation” (a corruption later insinuating itself into the Dutch Reformed Church’s justification of apartheid in South Africa) drove Dietrich Bonhoeffer to repudiate the idea of “orders of creation” (or “nature”) entirely and embrace instead a more dynamic “providentialist” and “preservationist” notion of “mandates” as divinely commanded “tasks.” Ethics, edited by Clifford J. Greene (Minneapolis, MN: Fortress Press, 2008), 389-394. Bonhoeffer insisted that the will of God is “a reality that wills to become real ever anew in what exists and against what exists” (Ethics, 74). It is true that he could not bring himself to accept the idea that creational types (not only societal but even natural) undergo “evolutionary” change. But while to reject the concept of evolution is regrettable, it does not amount to rejecting the concept of historical development since not all historical development is “evolutionary.” Indeed I’d wager that most of it isn’t. Jonathan Chaplin, Herman Dooyeweerd: Christian Philosopher of State and Civil Society (Notre Dame, IN: University of Notre Dame Press, 2011), 95-109. I’ve also been taken to task for departing too far from “essentialism.” See Eduardo Echeverria’s review essay in Journal of Markets and Morality 14.2 (2001), 463-483. See Zuidervaart’s sophisticated critical discussion of Hart’s account of such constraints as “nomic conditions” (138-144). On which Zuidervaart acknowledges his indebtedness to Vollenhoven’s account rather than Dooyeweerd’s: “Whereas Doooyeweerd’s emphasis on norms being creationally given in principle makes human ‘positivizations’ seem less fallible and changeable, Vollenhoven’s emphasis on the human giving of principles makes the norming character of modal law seem less natural and law-like” (10-11). Equally, I agree that the human capacity to discern societal principles does not rest on the ability to make logical distinctions but rather displays the capacity to respond to something that “comes from outside themselves” (324). We might add that, to the extent that solidarity was understood in his sense in the premodern world, it was, arguably, the result of the gradual permeation of the Christian idea that all are made in the image of God (however poorly that was put into practice). It is not the invention of the Enlightenment. See e.g., Larry Siedentop, Inventing the Individual: the Origins of Western Liberalism (London: Allen Lane, 2014). This point is different to that made at 324, where Zuidervaart claims, more plausibly, that “we do not know what political justice will require on the new Earth.” On the other hand, we can count on it not meaning “lording over each other as the Gentiles do” (Mark 10: 42). Put differently: is there any room in Zuidervaart’s approach for a notion of “inviolable human rights”? The same question arises with Zuidervaart’s proposal that societal principles are both “commonly holding and commonly held” (262), intended to clarify the “hermeneutical texture” of such principles. I sense an intuitive affinity with Zuidervaart’s intentions here. I have no problem with what one might call the “soft constructivist” notion that, not only do principles stand in need of human interpretation but also that these interpretations themselves partly constitute what such principles amount to. I can also see the sense in which the wide societal endorsement of a principle like justice generates a bond that “holds people in common.” But what the passage claims beyond this remains opaque to me, and I’m not fully enlightened by the elaborations at 284. As Jonathan Burnside explains compellingly in God, Justice and Society: Aspects of Law and Legality in the Bible (New York: Oxford University Press, 2012). Jonathan Chaplin is Director of the Kirby Laing Institute for Christian Ethics (KLICE: www.klice.co.uk), and a member of the Cambridge Divinity Faculty. He was Associate Professor of Political Theory at ICS from 1999-2006, holding the ICS’s Dooyeweerd Chair in Social and Political Philosophy from 2004-6. He was Visiting Lecturer in Christian Social and Political Thought at the VU University, Amsterdam from 2007-2011. He is a Senior Fellow of Cardus and formerly served on a board of Citizens for Public Justice. His is author of Herman Dooyeweerd: Christian Philosopher of State and Civil Society (University of Notre Dame 2011). He has also co-edited God and the EU: Faith in the European Project (Routledge 2016), Living Lightly, Living Faithfully: Religions and the Future of Sustainability (Faraday Institute/KLICE 2013), God and Global Order: the Power of Religion in American Foreign Policy (Baylor 2010) and God and Government (SPCK 2009). He is finally working on a book of his own again, entitled Faith in Democracy? Towards a Post-secularist Settlement. This summer, Chaplin will teach a course entitled "Political Theology and the Secular State" at ICS. See his other contribution to this symposium here. What I appreciate in Lambert's work on "macrostructures" is his realization that the form of social critique within the context of "sphere-sovereignty" as Vollenhoven, Dooyeweerd, and the reformational tradition has generally theorized it ignores something crucial in the emergence of a highly differentiated social and cultural pattern in the West, namely, that we have laid special emphasis upon two such spheres--the political sphere organized as the bureaucratic state and the economic sphere organized as the market economy. All other social and cultural spheres can by contrast be grouped within what Lambert terms civil society. He then tries to describe the interrelations of these marcrostructures. This is surely a starting point for a transformational critique. But it does beg the question whether this macrostructural context for social and cultural spheres is itself normative in principle, and if in principle whether its present patterning is normative. I am wondering whether I am right to hear in Jonathan's analysis a genteel and indirect way of putting these issues on Lambert's table. Should the institutional weave of modern society be such that so great a privilege is accorded to the bureaucratic state and the market economy. And if we might think of the state and economy as rightly foregrounded, must or even ought they to take the form of the BUREAUCRATIC state and the MARKET economy. These are questions that seem underplayed in Lambert's chapter, at least as it has been represented in Jonathan's analysis. It is true that incrementalist transformation such as reformational thinkers most often approve must start with where we are at. But surely the question must equally be asked whether that structuration of our world is part of the problem or solution. It seems to me that the predominance of state and economy in our social and cultural world is largely taken for granted. I wonder about that. I cannot however quite make out if that is one of the things Jonathan is wondering about? So the question for me is simply whether the macrostructures Lambert identifies are a potential virtue of Western society or a structural deviation. And if one is minded to say the latter, what does that mean for one's vision of social and cultural transformation? Bob - thanks for putting that basic question more clearly than I did. Yes, I now see it is one of my implicit questions to Lambert and I also look forward to his response. As I read him, however, I think he's saying this: the phenomenon of macrostructures arises from what was in principle a legitimate modern development towards the proper 'differentiation' of distinct institutional spheres - here notably the state and the economy (composed, we might add, of complexly interacting corporations, households, consumers, in complex varieties of market, other 'systemic' interactions, etc). But these spheres have both become internally distorted (the state, one-sidedly 'administrative'; the economy, one-sidedly 'proprietarian') and (therefore) illicitly expansionist and predatory, threatening to 'colonize' civil society (and presumably other institutional spheres not formally included within civil society, eg the family/household; neighbourhood; etc.). Thus the function of the concept of macrostructure does seem to be primarily diagnostic and critical: to identify large-scale societal distortions of what were (and presumably could be again?) normative developments. I don't think Lambert is suggesting that macrostructures are some kind of 'super-spheres' legitimately overarching other spheres.